Over a year ago, when we moved here, Joel and I discovered just how lucky we were to have stumbled into such a wonderfully accepting and progressive community. We chose the Boyceville area strictly because of the property we bought. It was our dream and fit the bill for just what we wanted. A home, with a boarding kennel business and enough land to work towards sustainability. It didn’t take long to realized we had the added bonus of wonderful neighbors and a caring community that seemed to be very cohesive and supportive. Imagine my surprise when I discovered last week that the village of Boyceville has a breed ban on Pit Bulls. Ordinance 7-1-9 was passed in 1997, making it illegal to own a Pit Bull within the Village. I’m very familiar with breed bans, having moved from Denver, where you could actually be stopped and your dog confiscated if you were caught driving within the city limits with a Pit Bull in your car. So, ever since I found this out, I’ve found myself wondering what does it take for people to realize that it is 99% owner and 1% breed that creates a dangerous animal? As a kennel owner I have had at least three pit bulls board at our facility since we opened and everyone one of them is friendlier than some five lb. lapdogs. Even a Labrador Retriever can be mean and vicious under the right circumstances. And when someone says, “But, the breed is predisposed…” I can’t even listen because it’s been proven over and over how false that statement is. 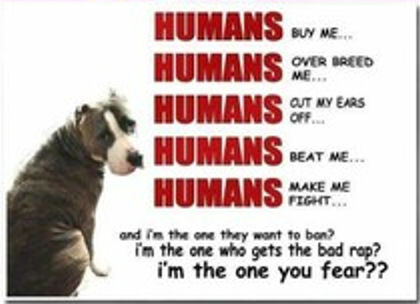 Breed Bans do nothing but punish the owners who love their dogs like the companions they are and it’s been my experience that these ordinances are passed by suspicious, easily swayed people who believe the hype and propaganda attached to a few sensational occurrences that have made the news. For every pit bull (or any other breed) attack you read about in the paper, there are thousands of sweet, loving pit bulls (or any other breed) you will never hear from. Why don’t we license the dog owners instead?